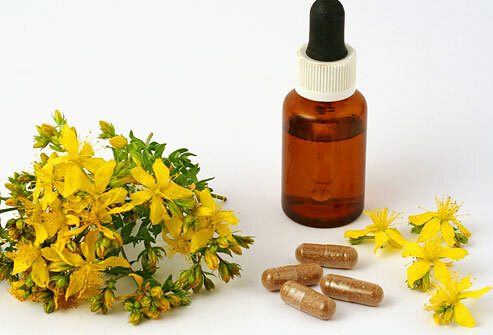 St. John’s Wart is a herb, and its flowers and leaves can be used for mood balancing and a positive state of being. The herb has been commonly used in treating mild depression, seasonal affective disorder (SAD), menopausal symptoms, anxiety and PMS. So, St. John’s Wart sounds simply amazing. The fact that this is an all-natural herb rather than a chemically-made pill is definitely a plus for me, Still, I had a lot of questions about this herb. Naturally, I turned to the internet for more information. All of this I think is very valuable for anyone thinking of taking St. John’s Wart for any of the above listed disorders. I pulled this information off the U.S. National Library of Medicine. Two chemicals are naturally found in St. John’s Wart, and they are hypericin and hyperforin. They act on chemical messengers in the nervous system that help regulate the mood. This is the part that had me nervous about this natural herb. If you don’t take any other medications, go right ahead and take St. John’s Wart. Otherwise, use caution. In some countries, the herb is banned due to its interaction with other medications. Some common ones include birth control, anti-depressants, anti-anxiety medications, heart medications, cancer treatments, liver medications, HIV/AIDS medications, sedatives, anti-blood clotting medications and medications for headaches. So guys, if you are on any medication at all prescribed any of the above medications, DON’T TAKE ST. JOHN’S WART until you’ve talked to your doctor. It’s either one or the other with St. John’s Wart. I would only feel comfortable taking this herb if I was free of any medications.